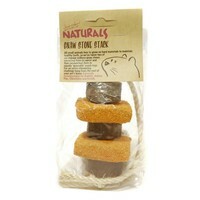 Rosewood Naturals Gnaw Stone Snack is infused with carrot to deliver a nibbling sensation! This gnaw stone provides both mental stimulation and a hard surface on which your pet can gnaw down their continually growing teeth. Small animals will find this toy an exciting challenge as they nibble away at the carroty rings sandwiched between equally gnawable wood.